Nature has a penchant for inventing armor. Today, we have armadillos, pangolins, turtles, and pill-bugs. And from the past, there were glyptodonts (large, squat, relatives of sloths and armadillos that died out about 10,000 years ago) and glyptosaurs (lizards now extinct for 40 million years), and the long-gone trilobites. But nobody did it like ankylosaurs, the Mesozoic armor-plated, spiked-shouldered experts who elevated hunkering self-defense to an art. As their name implies, ankylosaurs (ankylo - fused; saurus - lizard) were encased in shell-like dermal armor (Figure 7.1), a pavement of bony plates and spines - each embedded in skin and interlocked with adjacent plates - that formed a continuous shield across the neck, throat, back, and tail. In many cases, it covered the top of the head and cheeks. The armament varied from species to species, and is used to identify particular ankylosaurs, even from scrappy material. Under the armor, the ankylosaur body is round and broad, and clearly designed for housing a large gut to digest food. 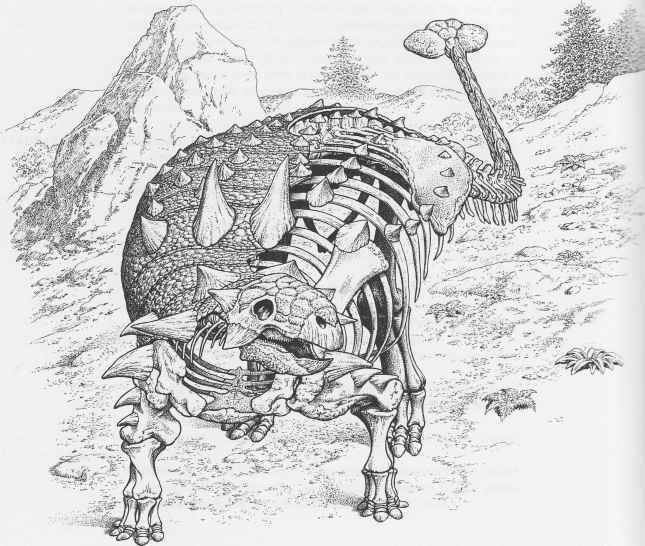 Likewise, the head was low and broad, and equipped with simple, leaf-shaped teeth for pulverizing whichever plants an ankylosaur chose to feed on (Figure 7.2). These stocky quadrupeds were rarely over 5 m in length, although some (such as Ankylosaurus) ranged upward of 9 m. Like stegosaurs, the limbs were short, with the hindlimb exceeding the length of the forelimb by 50%. These proportions are in keeping with the general construction of the body and the presumed slow pace of the animals. Ankylosauria was at its acme toward the end of the Cretaceous, but somewhat like the proverbial trail of bread crumbs, there are evolutionary links - often based on pretty fragmentary remains - back to the Middle Jurassic. Fortunately, there have been concerted efforts to understand the anatomy, diversity, and phylogeny of all of these forms. From a flurry of efforts in the 1980s, individually by W. P. Coombs of Amherst College in Massachusetts, T. Maryariska of the Muzeum Ziemi (Warsaw, Poland), and P. C. Sereno of the University of Chicago, it is clear that the ankylosaur clade consists principally of two great clades: Nodosauridae and Ankylosauridae. Members of Nodosauridae had relatively long snouts, well-muscled shoulders, flaring hips, and pillar-like limbs. All of course were armor covered and many also had tall spikes and spines on their backs and shoulders. Nodosaurids are known principally from the Northern Hemisphere (North America and Europe), although new discoveries in Australia and Antarctica have extended the geographical range of these animals deep into the Southern Hemisphere. Figure 7.2. Left lateral view of the skulls of (a) Shamosaurus, (b) Ankylosaurus, (c) Pinacosaurus, (d) Tarchia, (e) Silvisaurus, and (f) Panoplosaurus. Going their way several paired knobs along its length. The head is shorter and broader in ankylosaurids than in nodosaurids and there are large triangular plates attached to the rear corners of the skull (what are called squamosal "horns"). 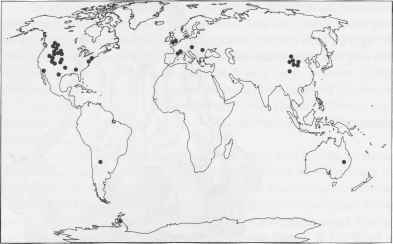 Ankylosaurs have a worldwide distribution, predominantly from North America and Asia, but also from Europe, Australia, South America, and Antarctica (Figure 7.3). The best-preserved of these finds come from Asia, particularly Mongolia and China, where spectacular specimens are nearly complete and articulated, in most cases preserved in an upright pose or on their sides. In contrast, in North America, only partial skeletons have yet been found, and these are often upside-down, sometimes in rocks deposited along the sea shore or even in rocks representing open marine environments. Nobody ever claimed that these armored dinosaurs were ocean-going animals, but the North American forms at least must have lived in terrestrial habitats sufficiently close to the sea that their bloated or partially dismembered carcasses might have been carried out with the tide. The flipping upside-down presumably comes from the heavy nature of their armored backs: a floating ankylosaur carcass should turn over prior to settling out on the bottom of a stream channel, lake, or ocean floor. Figure 7.3. Global distribution of Ankylosauria. In addition to these general preservational considerations, ankylosaur finds most commonly consist of individual skeletons or isolated partial remains; there is only one ankylosaur bonebed known. Perhaps this indicates that these animals had solitary habits or lived in very small groups. Even from our incomplete window on the past, it appears reasonably certain that ankylosaurs did not enjoy the company of huge herds. Food and mouths to feed In whatever size groups, it is clear that ankylosaurs had a very low browsing range, foraging no more than a meter or so above the ground. But what were they foraging for? Bugs? F. Nopcsa once suggested that ankylosaurs were insectivorous, but this idea is no longer given much credence. (How many beetles would it take to keep a 3500 kg ankylosaur going? And for how long?) Instead, it is now thought that these animals fed exclusively on plants. Why this is so comes from a look at the digestive system, from the beak, mouth, and teeth at the front end, as well as the far extreme of the gut. Figure 7.4. Palatal view of the skull of (a) Euoplocephalus and (b) a tooth of Edmontonia. imply less selective feeding, in which plant parts were indiscriminately bitten off from the bush or pulled from the ground. How the food was then prepared for swallowing is a bit of a mystery. Like stegosaurs (and pachycephalosaurs; see Chapters 6 and 8), the triangular teeth of both nodosaurids and ankylosaurids are small, not particularly elaborate, and less tightly packed than those of other ornithischian dinosaurs (Figure 7.4b). However, tooth wear indicates that chewing involved not only puncturing of foods, but also grinding action as well. In addition, it is likely that ankylosaurs had a long, flexible tongue (they have large hyoid bones - which support the root of the tongue - in their throats) and an extensive secondary palate that allowed them to chew and breath at the same time. Moreover, deeply inset tooth rows suggest well-developed deep cheek pouches to keep whatever food was being chewed from falling out of the mouth. Likewise, the jaw bones themselves were relatively large and strong (although lacking enlarged areas for muscle attachment). Many ankylosaur jaw features - except for tooth design and placement - suggest that ankylosaurs were reasonably adept chewers. Perhaps the paradox of simple teeth placed in strong, cheek-bound jaws can be understood by looking not at how much chewing was done prior to swallowing (there obviously was some), but at the rear end of the animal, where the majority of plant digestion must have been accomplished by gut fermentation. Here, bacteria lived symbiotically within the stomach (or stomachs, because ankylosaurs may well have had a series of them). The stomach (or stomachs) would have served as a great fermentation vat, decomposing even the toughest, woody plant material. Among modern mammals, this method of breaking down tough plant material is well known in ruminants such as cows. The amount of food needed to sustain these large animals must have been great, and consequently the gut must have been huge. Huge guts mean equally huge abdomens. In ankylosaurs, the very deep rib cage circumscribed an enormously expanded abdominal region and this can only mean that digestion took place in a very large, perhaps highly differentiated, fermentation compartment in these armored dinosaurs. R. T. Bakker called this hind-gut fermentation system "after-burner" digestion, analogizing, we fear, jet exhaust with that of fermenting ankylosaurs. The combination of browsing at low levels and having anatomy indicative of chewing and fermenting places limits on what kinds of plant ankylosaurs may have fed on. At the levels where ankylosaurs concentrated, the undergrowth consisted of a mixture of low-stature ferns, gymnospermous plants such as cycads and bennettitaleans, and, during the Late Cretaceous, shrubby angiosperms (see Figure 16.11). What a rich array of plants to choose from, even within the first few meters above the ground! Defensive moves Ankylosaurs may not have been particularly adept at making such choices, however, because their brain power was close to the bottom of the dinosaur range (only sauropods had smaller brains for their size; see Chapters 6 and 11, and Box 15.4). According to J. A. Hopson's calculations, ankylosaurs had slightly less brain mass per kilogram of body weight than stegosaurs and much less than all other dinosaurs except sauropods. Hand in hand with slow thinking, ankylosaurs were among the slowest moving of all dinosaurs for their body weight. According to R. A. Thulborn's calculations from limb size and estimated body mass, these animals were able to run no faster than 10 km/h and walked at a considerably more leisurely pace (about 3 km/h). Figure 7.5. Dorsal view of the body armor of Euoplocephalus. Figure 7.6. Dorsal view of the body armor of Sauropelta. of gravity of the animal. Could these features mean that the fore- and hindlimbs were used in conjunction with body armor and, in ankylo-saurids, a stiffened tail and terminal club? In the context of defense against predators, the answer is a resounding "Yes." Consider other aspects of defense. First, in all ankylosaurs the entire upper surface of the body - the head, neck, torso, and tail - is covered by a pavement of bony plates (Figures 7.5 and 7.6), a condition quite unlike that in stegosaurs or more basal thyreophorans. Nodosaurids, but not ankylosaurids, also retain the formidably sharp parascapular spines that were also seen in stegosaurs. Ankylosaurids were even more modified, producing armor literally everywhere, even over the eyes. And of course there is the formidable ankylosaurid tail-club (Figure 7.7), paired masses of bone set at the end of a tail (itself about half the length of the body), in some cases augmented by spikes along the length of the tail. How this tail and its terminal club worked is surely a masterful mechanical feat, fully as skillful as any mace-wielding knight. While the front part of the tail was relatively free to swing side to side, the rear half was stiffened by modified vertebrae, as well as by a series of longitudinally running tendons. These latter provided firm attachment for the powerful muscles, but more especially they added considerable stiffening of the end of the tail. 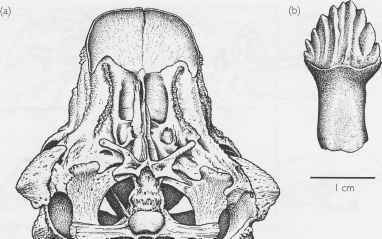 Using the forward flexibility of the tail vertebrae and the stiffened distal end, the club could have been forcefully swung side to side without the whiplash effect of over oscillation of the club and the rest of the body. It is now easy to imagine how an ankylosaur might have behaved while under attack from one of its contemporary predators, among whom were the likes of Deinonychus, Tarbosaurus, and Tyrannosaurus. It was either offense or defense: tail clubbing or hunkering down. Who knows what neural pathways or synapses might determine one or the other of these options for an ankylosaur, but ultimately the game must have been to persuade the predator to GO AWAY. The only active defense available to ankylosaurids was a club bash to the shins. In order to effectively wield their weaponry, these animals must have first planted their hindlimbs and then rotated their forequarters with their strong forelimb muscles, ever keeping watch on the threatening predator. For nodosaurids, this was a head-first (or shoulder-first) affair, but in ankylosaurids there was a bit of crocodile defense about them: "Look me in the eyes, but watch out for my tail." If such an offensive strategy fails to dissuade a predator, then the ankylosaur fail-safe was assuredly to hunker down and wait out the attack. With its legs folded under its body, a 3,500 kg ankylosaur would have been very difficult to flip over. Safe under protective armor, both nodosaurids and ankylosaurids were virtually impregnable to predators. They were, in short, the best-defended fortresses of the Mesozoic. Ankylosauria is defined as that clade of dinosaurs consisting of the common ancestor of Panoplosaurus (a nodosaurid) and Euoplocephalus (an ankylosaurid) and all of the descendants of this common ancestor (Figure 7.8). As we learned in Chapter 6, Stegosauria is the closest relative to Ankylosauria; together they form the Eurypoda. More distant relationships are with Scelidosaurus, Emausaurus, and Scutellosaurus within the context of Thyreophora (see introductory text to Part II: Ornithischia). Reflecting the importance of heavy armoring to ankylosaurs, it is not surprising that the accoutrements of armor and/or its support comprise the majority of derived features uniting the clade Ankylosauria. These animals all share, among other features, closure of the antorbital and upper temporal openings, ossification and fusion of a keeled plate onto the side of the lower jaw, fusion of some of the first couple of tail vertebrae to the sacral vertebrae and ilium, rotation of the ilium to form flaring blades, closure of the hip joint, and of course the development of a dorsal shield of symmetrically placed bony plates (both large and small) and spines. Figure 7.8. 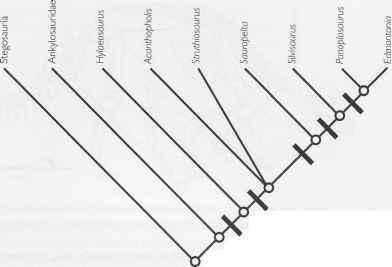 Cladogram of'higher'Thyreophora, emphasizing the monophyly of Ankylosauria. Derived characters include: at I closure of antorbital and upper temporal openings, ossification and fusion of keeled plate onto side of lower jaw, fusion of first tail vertebrae to sacral vertebrae and ilium, rotation of ilium to form flaring blades, closure of hip joint, development of dorsal shield of symmetrically placed bony plates and spines. Figure 7.9. 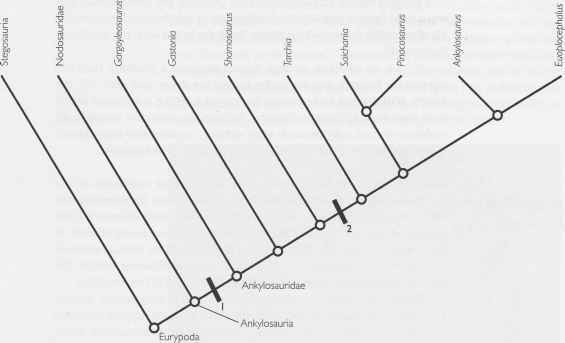 Cladogram of Ankylosauridae, with its two closest relatives, Nodosauridae and Stegosauria. Derived characters include: at I pyramidal squamosal boss, shortening of premaxillary palate, presence of premaxillary notch, rostrolaterally directed mandibular ramus of pterygoid, tail-club; at 2 anterodorsal and posteroventral arching of palate, vertical nasal septum, rugose and crested basal tubera; at 3 caudal end of postaxial cervical vertebrae dorsal to cranial end, fusion of sternals. Figure 7.10. Left lateral view of the skeleton of Sauropelta without its armor shield. Note the projection on the scapula (arrowed), known as the acromial process. Evolution within Ankylosauria has followed two principal pathways since their origin sometime in the Jurassic: Ankylosauridae and Nodosauridae. All ankylosaurs belong to one or the other of these two clades. Having already worked through what it takes to be a member of Ankylosauria, who indeed are the constituent nodosaurids and anky-losaurids? To begin with, ankylosaurids have a pyramidal squamosal boss ("horn"), shortening of the front of the palate, a notch in the pre-maxilla, modification of the palate, and a tail club (Figure 7.9). Recent work by Matt Vicaryous and co-workers indicates that Gargoyleosaurus, Minmi, and Gastonia are successively more closely related to remaining ankylosaurids. Forming an unnamed taxon, these remaining ankylosaurids are united by an arched palate, vertical nasal septum, and modifications of the base of the braincase. They begin with a small clade of Shamosaurus and Gobisaurus, followed in successively closer relationships by Tsagantegia, Tarchia, a small grouping of Ankylosaurus and Euoplocephalus, Talarurus, Pinacosaurus, and Saichania. These last three ankylosaurids are united by fusion of the sternal bones and changes in the shape of the neck vertebrae. Figure 7.1 I.CIadogram of Nodosauridae, with its two closest relatives, Ankylosauridae and Stegosauria. Derived characters include: at I knob-like acromion on scapula; at 2 distinct pattern of one or two flat polygonal ornamentation across anterior region of snout, oral margin of premaxilla continuous with maxillary tooth row, anterodorsal palatal arch, rugose, crest-like basal tubera. with maxillary tooth row, and modification of the palate and braincase. Ankylosaurs were there at the very beginning of the history of dinosaur studies. Along with Iguanodon and Megalosaurus (an ornitho-pod and a theropod, respectively), Hylaeosaurus (hylaios - forest-dwelling) was also a charter member of Sir Richard Owen's Dinosauria. This first-named ankylosaur hails from the Tilgate Forest area of southern England, from Lower Cretaceous rocks (approximately 130 million years old). Very little detail is known of the anatomy of Hylaeosaurus despite efforts by its namer, Gideon Mantell, and a number of later workers. After the initial discovery, no further finds helped to enlarge our understanding of this animal. As a result, it stands today almost as completely known as it did in the mid-1800s: mostly the front half of the skeleton and parts of the armor shield. Austria. In this collection were some interesting skeletal elements that he thought belonged either to a bird or a crocodile. These Bunzel called Struthiosaurus (strouthion - ostrich). It was not until this material was restudied by English paleontologist H. G. Seeley, and especially when new material of Struthiosaurus was discovered in the Transylvanian region of what was then Hungary (now Romania) by Nopcsa, that the true ankylosaur identity of this dinosaur was finally revealed. Finally, to close out the century, Richard Lydekker of the British Museum (Natural History) in London named Sarcolestes (sarkos - flesh; for flesh-robber) for an unusual lower jaw from the Middle Jurassic (approximately 160 Ma) of central England. Little did Lydekker realize at that time that this piece of jaw had nothing to do with a flesh-eating dinosaur; thanks to the much later work of Peter Galton of the University of Bridgeport, Connecticut, it was revealed in the 1980s that Sarcolestes was an ankylosaur. Discoveries of North American ankylosaurs began in the late 1880s. It was then (1889) that Yale paleontologist 0. C. Marsh announced a new armored dinosaur, Nodosaurus (nodus - knob). Discovered in Wyoming in Lower Cretaceous rocks, Nodosaurus is represented by only an incompletely preserved postcranial skeleton and armor. North of the USA-Canada border, what was eventually to be named Euoplocephalus (eu - well; hoplon - shield; kephale - head), one of the alltime best known of these armored dinosaurs, was discovered in the great badlands of the Red Deer River of Alberta and given its first name "Stereocephalus" in 1902 by L. M. Lambe of the Geological Survey of Canada. Unfortunately, this name had already been given to an insect,1 so in 1910 Lambe gave it its presently recognized name, Euoplocephalus. Thereafter, on a nearly regular basis (on the order of a name every 10 years), new ankylosaurs began to be discovered and named. Ankylosaurus - the namesake of the group - was discovered in Upper Cretaceous rocks in Montana and named by Barnum Brown of the American Museum of Natural History in 1908. Panoplosaurus (pan - all), like Euoplocephalus, was found in Alberta and also named by Lambe. C. M. Sternberg of the National Museum of Canada continued the Lambe tradition, naming Edmontonia (for the Edmonton Formation of Alberta) in 1928. I Insects continue to plague dinosaur nomenclature. As recently as 1993, the Mongolian Cretaceous bird "Mononychus" was described. Unfortunately, the name was already occupied by a beetle. Consequently, "Mononychus" had to be renamed Mononykus, the name this remarkable bird carries to this day (see Chapter 14). He stands in the middle of the remote, rugged Mongolian desert: high leather riding boots, riding pants, broad-brimmed felt hat, leather-holstered sidearm hanging from a glittering ammunition belt. He carries a rifle and knows how to use it. Nobody else dresses like him, but then nobody else is the leader of the American Museum's Central Asiatic Expeditions to Mongolia (a place which, at the time of the expeditions, the 1920s, could have been the moon). He is Roy Chapman Andrews, who 50 years later will be the inspiration, it is most plausibly rumored, for Indiana Jones (Figure B7.I.I). Andrews always knew that he was a man with a destiny. Although he began his career at the American Museum of Natural History (AMNH) modestly (he scrubbed floors), training in mammalogy (an M.A. ), sheer will, charisma, and a very good idea carried him the distance. He had traveled extensively, spoke several Asian languages more or less fluently (at a time when very few Westerners did), and had fabulous contacts in Beijing (then called Peking). His idea was simple: to run an expedition to what was then known as Outer Mongolia and to see what he could see. Andrews'timing was superb: the Director of the AMNH, the powerful H. F. Osborn, had concluded that the cradle of humanity was located in Outer Mongolia, and so Andrews was effectively offering Osborn the opportunity to prove his thesis right (the possibility that Osborn could be wrong did not seem to be of concern).The logistics of the expedition were extravagant: Dodge cars, resupplied by a caravan of camels would bear the brunt of the expedition.The expedition itself would consist of a range of earth scientists - paleontologists, geologists, and geographers - to explore the Gobi Desert, the huge desert that forms the vast southern section of Mongolia (then called "Outer" Mongolia, as if to emphasize its remoteness) and northern China. The journey was not without its risks.The Gobi Desert is a place of temperature extremes, beset by relentless strong winds. Politically, at the time, the region was an uproar China, the base of operations, was torn by civil strife. And in 1922, the year of the first of three expeditions, a revolution shook Mongolia. Moreover; only one fossil, a rhinoceros tooth, had ever been found in Mongolia. As it turned out, the Central Asiatic Expeditions were an unqualified success. Although Osborn's theory was not supported, Andrews brought back a wealth of fossils, including dinosaur material, that made Osborn's error easy to forget. 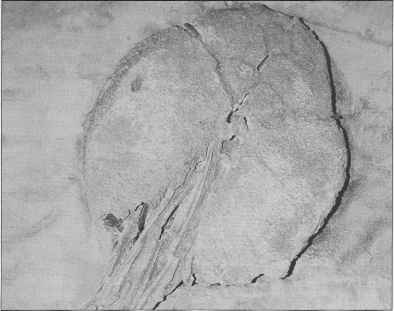 Among the most famous dinosaur finds of his expedition, for example, were Protoceratops (the species name of this famous dinosaur is andrewsi) and eggs; the first time that dinosaur egg nests were ever found. Other incredible finds included Velodraptor and a group of tiny Mesozoic mammals (still the rarest of the rare), Andrews and his field parties also found the largest land mammal and the largest carnivorous land mammal of all time (both Cenozoic in age). Other fossils were obtained whose significance was not completely understood. For example, it was only in 1992 that a specimen of Mononykus, collected by Andrews' scientists in the 1920s, was finally correctly identified. All in all, it was quite a haul. Andrews and his parties survived the Mongolian revolution of 1922, but eventually the expeditions came to an end when the political situation in China became too unstable and travel too dangerous. Andrews, himself, eventually went on to get the job held much earlier by Osborn, Director of the AMNH. He assured his place in history, however; by leading the Central Asiatic Expeditions. Expeditions) named by E. A. Maleev of the Paleontological Institute in Moscow. As we shift back to North America, T. H. Eaton of the University of Kansas discovered and named Silvisaurus (silva - forest) from Lower Cretaceous rocks of Kansas in 1960, and in 1970 J. H. Ostrom of the Yale Peabody Museum of Natural History named Sauropelta (pelte - shield) from the Early Cretaceous Cloverly Formation of Wyoming and Montana. Despite this pace, it was the end of the 1970s and 80s that were the bonanza years for ankylosaur discovery. In 1977, two ankylosaurs -Tarchia (Mongolian: tarchi - brain) and Saichania (Mongolian: saichan -beautiful) - were collected by the Polish-Mongolian Expeditions of the late 1960s and 1970s, and more particularly the important studies of Teresa Maryarislca of the Muzeum Ziemi (Museum of the Earth) in Warsaw, Poland. Minmi (named for Minmi Crossing, Queensland) surprised the world when R. E. Molnar of the Queensland Museum described this first ankylosaur from Australia, indeed from the Southern Hemisphere! The 1980s closed out with two new ankylosaurs from the Late Cretaceous of Mongolia: Shamosaurus (shamo - Chinese for desert, a reference to the Gobi Desert) and Maleevus (named in honor of E. A. Maleev), both named by T. A. Tumanova of the Paleontological Institute in Moscow (in 1983 and 1987, respectively). From the 1990s to the present, a wide array of new ankylosaurs has been discovered. Several have come from the Cretaceous of Asia. Tsagantegia (collected from Tsagan Teg in the Gobi Desert of Mongolia) named by Tumanova, hails from Mongolia, while four new genera are known from China: Shanxia (named for Shanxi Province, where it was found) discovered by P. M. Barrett and co-workers, Tianzhenosaurus (Tianzhen lizard) discovered by Q. Pang and Z. Cheng, Gobisaurus (named for the Gobi Desert) described by M. Vickaryous and co-authors from Canada and China, and Liaoningosaurus (named for Liaoning Province) described by X. Xu, X. Wang, and X. You. Interesting though these Asian forms are, new discoveries in the USA made since 1990 have helped fill in many of the blanks in the history of ankylosaurs during the Late Jurassic through the mid-Cretaceous. Of these, Mymoorapelta (named for Mygatt-Moore Quarry), described by J. I. Kirkland and Carpenter, and Gargoyleosaurus (gargoyle lizard) described by Carpenter and collaborators, represent the best of the Jurassic record of ankylosaurs. Important new discoveries in Texas (Texasetes (Texas resident) named by Coombs, and Pawpawsaurus (named for the Paw Paw Formation) described by Y. Lee) provide information on Early Cretaceous ankylosaurs from the Gulf Coast region. Continued work by Carpenter, Kirkland, and their several co-investigators in the mid-Cretaceous of Utah has yielded Gastonia (named for Robert Gaston, who discovered it), Animantarx (living fortress), and Cedarpelta (named for the Cedar Mountain Formation). Finally, three new ankylosaurs have been described from the Late Cretaceous of Kansas, New Mexico, and California: Niobrarasaurus (named for the Niobrara Chalk Formation by Carpenter and co-authors), Nodocephalosaurus (node head lizard; named by R. Sullivan) and Aletopelta (wandering shield; named by T. Ford and Kirkland). Important readings Bakker, R.T. 1986. Dinosaur Heresies. William Morrow, New York, 481pp. Carpenter, K. 1982. Skeletal and dermal armor reconstruction of Euoplocephalus tutus (Ornithischia: Ankylosauridae) from the Late Cretaceous Oldman Formation of Alberta. Canadian Journal of Earth Sciences, 19, 689-697. Carpenter, K. 1984. Skeletal reconstruction and life restoration of Sauropelta (Ankylosauria: Nodosauridae) from the Cretaceous of North America. Canadian Journal of Earth Sciences, 21,1491-1498. Carpenter, K., Dilkes, D. and Weishampel, D. B. 1995. The dinosaur fauna of the Niobrara Chalk Formation .Journal of Vertebrate Paleontology, 15, 275-297. Coombs, W. P., Jr 1978. Theoretical aspects of cursorial adaptations in dinosaurs. Quarterly Review of Biology, 53, 393-418. Farlow, J. 0.1978. Speculations about the diet and digestive physiology of herbivorous dinosaurs. Paleobiology, 13,60-72. Hopson, J. A. 1977. Relative brain size and behavior in archosaurian reptiles. Annual Review of Ecology and Systematics, 8,429-448. Hopson, J. A. 1980. Relative brain size in dinosaurs - implications for dinosaurian endothermy. In Thomas, R. D. K. and Olson, E. C. (eds. ), A Cold Look at the Warm-Blooded Dinosaurs. Westview Press, Boulder, CO, pp. 287-310. Maryanslca, T. 1977. Ankylosauridae (Dinosauria) from Mongolia. Palaeontologia Polonica, 37,85-151. Sereno, P. C. 1986. Phylogeny of the bird-hipped dinosaurs (Order Ornithischia). National Geographic Society Research, 2, 234-256. Vicaryous, M., Maryanslca, T. and Weishampel, D. B. 2004. Ankylosauria. In Weishampel, D. B., Dodson, P. and Osmôlska, H. (eds. ), The Dinosauria, 2nd edn. University of California Press, Berkeley, pp. 363-392. Andrews, R. C. 1929. Ends of the Earth. G. P. Putnam's Sons, London, 355pp. Andrews, R. C. 1933. Explorations in the Gobi Desert. National Geographic Magazine, 63, 653-716. Andrews, R. C. 1953. All About Dinosaurs. Random House, New York, 146pp. Preston, D. J. 1986. Dinosaurs in the Attic. St Martin's Press, New York, 244pp.